how much should one spend on a violin case? I am surprised to see several violinists who have pretty good quality violins and use ordinary foam case that cost around $100. Don't they want their violin be well protected? Then I thought, put your violin in a foam/wood case actually make you more aware of where its where about and safety and thus be more careful with it, because I have seen kids with thermalplastic/fiberglass cases who are very rough with them while the instruments are in the cases. I personally would not spend thousands of dollars on my violin case - I don't have a good violin anyway. I would want an sturdy case that could provide optimal protection to my violin. So spend between 10 and 20% of the cost of your violin on your case sounds reasonable to me. Well, I don't know if a percentage of the price of the violin is necessarily the best long-term route. Cases are not forever wedded to instruments. If you see a case that seems reasonably priced for the protection and features it offers, it could be a good buy even if it costs more than your current violin. That way when you upgrade someday to a violin you like better, the best case is home for your best violin and #2 can have the #2 case. You put the good stuff with the good stuff when you're putting your front line instrument and it's kit together. #2/backup can be the stuff that is good and used to be good enough, until you decided to upgrade. The balance of light and compact vs strong and with plenty of room for accessories and etc is something that I doubt any two musicians would agree on. Some folks will want spaces for 4 bows and a string tube and vapour bottle and hygrometer and thermometer.. Others will want just the essentials and good protection. I haven't seen as much with violins, but I can tell you that some of the most heinous damage I have seen happen to instruments over the years happened to instruments with no case or a very poor case. Mind you, I think the rigid foam and cloth small cases that come with inexpensive new violins are way better than the glorified cardboard "cases" that came with even some decent brand guitars in years gone by. They seem to provide a pretty good degree of protection for the (often free with the violin) price. But if you see yourself still playing 10, 20, 30 years from now, a reasonable but decent case you bought now may still be with you and the violin you are playing then. I don't think it would be silly to look at getting something that will last you and where you can be confident that your main violin will always be well protected. I agree with you that % is not the best way to decide how much one should spend on a violin case. I also agreed with you that foam case that came with inexpensive case could protect a violin pretty well. I recently bought a 3/4 size violin case for my daughter, it only cost $24 (on sale, original price was $30), it's light weight (foam) thus not strong but it has very good protection system. Whereas, my $60 case is heavier and stronger (wood) but since its protection system is not right, it might have done some subtle damage to my violin and it could cost more damage if the case is dropped than the cheap case since it does not have a well design protection system. 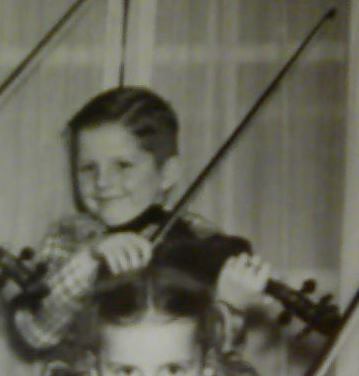 However, either one, if a 50- to 100-pound child props on it, the violin probably will be totaled. I like those thermalplastic cases, they are sturdy; however, I don't like the metal rim around it, because I have seen many rental violins in those cases and the edges of those violins are pretty dented. I bought two other more expensive (but not sky-rocking price) oblong full-size cases (for my birdeye violin and the 4/4 violin that I plan to make so I haven't used these cases yet) for their good looking appearance. I took a look at their protection system and found that they are pretty well made and designed. It's pretty study and heavy as well. However, I could not fit my Stainer copy in it (it's body length is either 14.25 or 14.5 inches), my 7/8 gem I fit in it, but it already has a case. Thought we might use it for my daughter's 3/4 violin or her 2nd 3/4 violin, but they are a little too big. I hope it will fit my birdeye violin, or even my 5 string violin, when I am done with them. Not really relating to your cases and only somewhat to some points we've mentioned.. But have you ever seen this story? Ok, well, it does relate to cases and case choices, but talk about a nightmare! Wow. I guess case rigidity is something to think about if you are constantly transporting your violin all over the place. I personally spent $75.00 on a case which listed for $130.00 for my $300.00 F/M Concert Master as at the time I bought it, it was violin only so I needed a case for it. I guess maybe the test would be to stand on the case just to see how protective it would be in case of a mishap. As far as Garret's accident, I don't know why he had it strapped on his back anyway unless he had both hands occupied with other stuff. The only time I use my case is when I'm on the way to the luthier and if an accident does occur, well I'm on my way to the repair shop anyway. I can definitely understand why a better case would be ideal for a child or professional violinist would be necessary. A child transporting / carrying it to school anything can happen and a professional constantly moving from one place to the other, things can happen. I have read something similar, not sure if it was Garrett. After I read that article, I carried my violin with the handle on the case. I love backpack style because it keeps your hands free for other things, especially if you are flying I could have my hands for other luggage and my child (or opening doors and carrying my lunch bag, etc), when I looked for cases, that's one feature I look for. Now that I read two stories and with my own experience being hit by a car and fell backward on my backpack full of books (like Garrett said, the violin probably saved him from severe injuries, my backpack probably saved me!) I thought may be backpack style isn't that important. I also remembered reading somewhere: when one carries a violin case with the handle, the lid should be the side face the leg and the bottom of the violin case should face outside, in case the lid was not shut tight and the violin was not strap down, when the lid opened up, the violin would not fall out because your thigh would have supported the open lid. For this reason, I like the canvas/cloth - zipper style that come with a flap that snap on, if you have one of the zippers zipped half way, or the flap snapped on, then your violin is pretty secured. so when your case was not shut properly and if you accidentally/carelessly grabbed only one of the handles, the violin would not fly out. I read somewhere a foam case help you be more alert about the safety of your violin. When I dropped my daughter off to orchestra, I have seen children sitting on their cases or swinging or banging it around. My thought is a study, better case may not help children learn to be careful with their instruments. When my daughter first started, I told her how to hold her case on her side, how not to lay it around - drive way, couch, in the middle of a room, etc, and make sure the zipper is zipped, the flap is snapped, the wrap wraps around both handles, etc, and that she may never sit on her case side way or on top and she should always put the case standing up on the side or its bottom - never up-side down. This happened to my CVN 500 violin once: my husband put it in the trunk, when I went and got it out, there was a dent on the case (I wondered what would happen if it was a wood, fiberglass, or thermalplastic case) because when he shut the trunk, the bar of the trunk door slammed on the case, my violin was okay and I learn a lesson to never put any violin cases near the side where the bars come down. yes, Ken, I strongly agreed with you, be careful is the bottom line, no matter what kind of case you have. @pky: Good point about having two handles. I have four cases and three have two handles with the velcro wrap tying them together. The other has only one solid handle like a suitcase which is held on with four short screws. I have tightened them in the past as they work their way out. I don't use that case. It's looks way nicer than it does in the pictures. I paid about $40 for mine, I only use it to store the violin and carry it to lessons. It's foamy and padded but I think if I travelled more I'd get something a bit sturdier. I still use the circa 1940's case my grandpa used. I don't carry my fiddle around much though. The "bow holders" are two clothespins my grandma glued inside. I want to get a better case, but the problem is that the mechanical tuner heads make the top end of the fiddle too tall to fit into a regular case. I am considering making my own case from some Styrofoam carved to fit the unusual shape of my fiddle - I just haven't figured out what to do for the outside of the case yet. Would we get discount for this one, too? Michael (my son) is a nice guy.